This February, Antonelli's Cheese Shop is thrilled to be celebrating its 5th anniversary. Acclaimed charcuterie producer Herb Eckhouse of La Quercia will be flying in to host this super-special "Pig Crawl" with Antonelli's (think Pub Crawl, but with cheese instead of beer). Mix and mingle with Herb, Antonelli's cheesemongers, esteemed chefs and fellow foodies as you crawl your way down East Sixth Street. 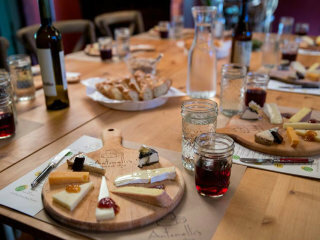 At each stop guests will munch on a prepared plate that highlights a La Quercia product as well as enjoy a beverage pairing.